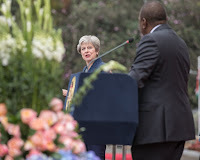 Thursday August 30, 2018 - President Uhuru Kenyatta’s war against corruption has received a major boost after visiting British Prime Minister Theresa May vowed to support him to the fullest. In an agreement signed between Uhuru and May at State House on Thursday, the British PM vowed to repatriate all proceeds of crime stashed away in all its jurisdictions. Besides the repatriation of the proceeds of corruption, May’s Government will support efforts to prosecute and conclude all major corruption cases in the country. “Whatever is held in the UK will be returned to build Kenya,” said the British MP. Uhuru vowed never to turn back in the fight against corruption promising to arrest anyone and everyone who is involved in the graft. “Fighting corruption is an important aspect for my legacy besides the Big 4 agenda,” Uhuru said.